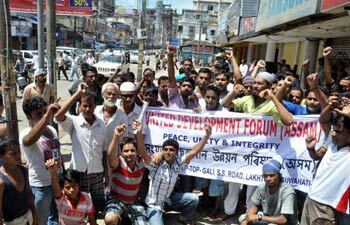 A day's bandh in Assam costs the state exchequer Rs.41.14 cr according to a 2005 study. Guwahati, Aug 30 : The Assam government Wednesday decided to ban calling of bandhs for the next one month in the state. Assam's Home Secretary G.D. Tripathi said the decision was taken in accordance with the Guwahati High Court order on January 2010 that declared bandhs as "illegal and unconstitutional". "First, the Kerala High Court termed bandhs as 'illegal' in 1997. In November 1997, the Supreme Court upheld the judgment of the Kerala High Court. The Guwahati High Court passed its order in 2010," Tripathi said. "We have decided to put a ban on calling of bandhs by any group or individual," he said, and added that cases will be registered under Section 188 of the IPC against those who violates the ban. A report by the Federation of Commerce and Industries in the North Eastern Region in 2005 had indicated that a day's bandh in Assam costs the state exchequer of Rs.41.14 crore. There were 75 days of bandhs in Assam in 2005.